The inherent worth and dignity of every person is embodied in Human Rights. While rarely enforced legally, Human Rights have inspired groups to organize and mobilize to achieve social change. Grassroots groups such as the United Workers, Coalition of Immokalee Workers, and the Vermont Workers Center have used Human Rights language and principles to organize workers, mobilize communities, and achieve systemic change. The Maryland Human Rights Authority provides research, advocacy, training, and legal representation to human rights groups in Maryland that desire this support. In accord with human rights principles, the Authority attempts to do this through the participation of those most affected by human rights violations. Workers, tenants, persons without housing, and those most experienced with the challenges of poverty are engaged, supported, and encouraged to advocate for themselves and their co-workers, neighbors and colleagues before local government councils, the General Assembly, Congress, and also provide, where possible, representation in administrative claims with agencies that administer safety net and social insurance programs. 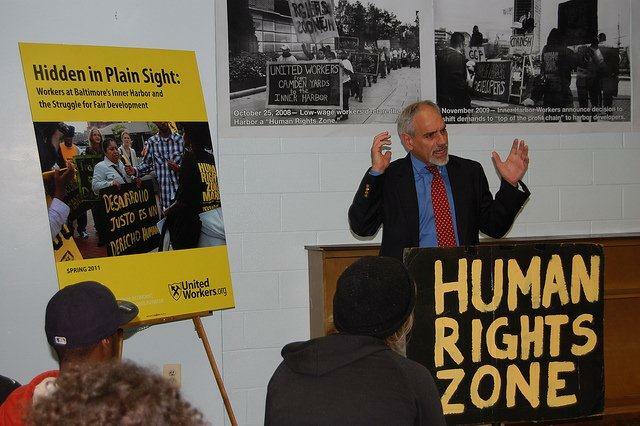 The Maryland Human Rights Authority uses all advocacy tools to advance human rights in Maryland (litigation, lobbying, mobilizing), but its mission is to support organizing and the movement to end poverty. It sees it clients as agents of social change and active participants in the human rights movement. Research, policy advocacy, legal representation, and training are used to achieve movement goals and to assist in developing leadership among those most impacted by human rights abuses.